Prep time: 10 minutes. Cook time: 45 minutes. Serves 8. Add yogurt, egg, vanilla and buttermilk. In separate bowl, mix flour and baking soda. Stir gently batter into a batter. Place in greased 8 inch square cake pan. These also make wonderful muffins. Follow same directions but place in muffin pan and bake about 20 minutes. The brand of certain ingredient are suggested, and based on the free grocery coupons you can clip at www.CommonKindness.com. Sara Tetreault is a wife, mom, home cook, chicken keeper, city dweller, and home swapper. She says she will trade just about anything – except husbands! Stunning and warm, you must check out her blog: http://gogingham.com. Thanks, Sara! Note: You may substitute ¾ tsp. pumpkin pie spice for the ground cinnamon, ginger and cloves. Mix sugar, salt, cinnamon, ginger and cloves in a bowl. Add egg and beat slightly. Add Karo syrup, pumpkin and evaporated milk. Spread apple pie filling in pie crust. Gently pour pumpkin filling over the apples. Reduce oven temperature to 350°F and continue baking for 35 to 40 minutes, or until knife inserted in pie center comes out clean. Serve with whipped Clover Stornetta Heavy Whipping Cream, if desired. The following recipe makes enough dough for two 9-inch Apple Pumpkin Pies. 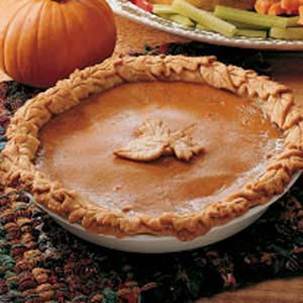 This recipe makes 2 disks for a single pie with a top and bottom crust or two pies without a top crust. In a food processor, combine flour, salt, and sugar; pulse to combine. Add butter; pulse until mixture resembles coarse meal, with just a few pea-size pieces of butter remaining. Pulse until dough is crumbly but holds together when squeezed with fingers (if necessary, add up to ¼ cup more water, 1 tbsp. at a time). To help ensure a flaky crust, do not over-process. Transfer half of dough (still crumbly) onto a piece of plastic wrap. Form dough into a disk ¾ inch thick; wrap tightly in plastic. Refrigerate until firm, at least 1 hour, and up to 3 days. Repeat with remaining dough. Line pie plate with crust and flute edges, if desired. Refrigerate crust for 40 minutes OR freeze for 20 minutes. Place aluminum foil on bottom of crust; weigh foil down with pie weights or dry beans. Cover the rest of the pie crust with foil. Unwrap crust and add filling. Redemption of Fleischmann’s and Karo coupons from CommonKindness.com generates funds for nonprofit organizations. Just in time for holiday baking, Fleischmann’s, the most trusted brand of yeast for more than 140 years, and Karo, the leading brand of corn syrup, has unveiled four coupons on CommonKindness, the free grocery coupon website that enables shoppers to save money and support charitable organizations. Every Fleischmann’s yeast coupon and Karo corn syrup coupon downloaded from CommonKindness and redeemed in a store generates funds for Share Our Strength’s No Kid Hungry® campaign and the nonprofit organization of the shopper’s choice. The Fleischmann’s and Karo brands’ legacy of community support includes its current efforts to help end childhood hunger in America by supporting the Share our Strength’s No Kid Hungry campaign, which is ending childhood hunger in this nation by ensuring all children get the healthy food they need, every day. As part of the partnership with CommonKindness, each Fleischmann’s or Karo product coupon redeemed will generate funds for the campaign. The goal of the No Kid Hungry campaign is to ensure every child has access to healthy food where he or she lives, learns and plays. The program connects kids in need with nutritious food and teaches their families how to cook healthy, affordable meals. To use coupons for Fleischmann’s and Karo and support nonprofits, go to CommonKindness.com, fill in the easy sign-up form, and designate your favorite nonprofit from the user-friendly directory. Then select the coupons, print them, and head to the store. ACH Food Companies, Inc. markets, sells, and produces a variety of cooking oils and other food ingredients, such as cornstarch, syrup, spices, and sauces. Its lineup of well-known brands includes Mazola (the #1 corn oil brand in North America), Argo corn starch, Fleischmann’s yeast, Karo corn syrup, and Spice Islands seasonings. To learn more, go to achfoods.com or contact Kate F. Hill at Olson PR (312) 577-1774. CommonKindness.com is the new free coupon website that operates on the principle of kindness and aims to benefit consumers, nonprofit organizations, and brands. CommonKindness is revolutionizing the online coupon industry by eliminating coupon loading and change costs, charging brands only for coupons redeemed, and donating 20 percent of its coupon revenue to nonprofit organizations chosen by CommonKindness shoppers. Do you remember these Karo Syrup ads–or am I getting really old? Karo Syrup has been used in recipes since 1902, and it remains a trusted brand in America’s kitchens. You can get free money-saving coupons for Karo syrup right now at http://www.CommonKindness.com. For many, the stuffing is the best part of the Thanksgiving feast. This fruity, aromatic recipe will have your guests making yummy sounds throughout the meal. Serves 18. Prep time: 25 minutes. Melt butter over medium heat in a 10-inch skillet. Cook celery and onion in butter, stirring frequently, until onion is tender. Stir in about 1/3 of the bread cubes. Place in large bowl, add remaining bread cubes and ingredients, and toss. Stuff turkey just before roasting. 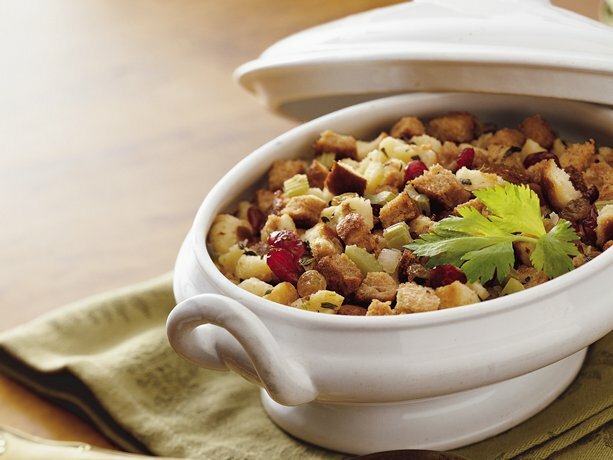 To bake stuffing outside of the turkey, place in greased 3-quart casserole or 13” x 9” x 2” rectangular baking dish, cover, and bake at 325°F for 30 minutes. Then, uncover and bake 15 minutes longer.The brands of ingredients are suggested based on the availability of free printable grocery coupons on www.CommonKindness.com. CommonKindness coupon purchases generate needed funds for your favorite nonprofit organizations. Join the movement today. A touch of Alter Eco Mascobado Cane Sugar added to KOYO Organic Tamari Sauce makes a rich, salty coating for whole almonds. These Tamari almonds are always a big hit at holiday parties. A hand-packed jar makes a tasteful hostess gift. Total preparation time: 75 minurtes. Makes 6 cups. Place oven racks on the upper and lower third rack slots. Spread almond out in one layer on two large, shallow baking pans. Stir together Tamari and sugar in a large heatproof bowl until sugar is dissolved. Add hot almonds and stir until coated well. Let stand 5 minutes, stirring occasionally. Return almonds to baking pans with a slotted spoon, spreading them evenly. Discard any liquid remaining in bowl. Bake almonds about 25 minutes, stirring and switching position of pans halfway through baking, until almonds are dark brown outside and golden inside—cut an almond in half to check color. Cool almonds completely in pans on racks about 20 minutes, stirring occasionally. 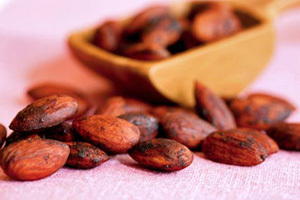 Cooled almonds can be placed in small gift bags or jars. Almonds kept in an airtight container at room temperature stay fresh up to 2 weeks. Note: The brand of certain ingredient are suggested based on current availability of printable grocery coupons on www.CommonKindness.com. Mix Batter ingredients in a greased 9 ½ inch deep dish pie plate. Combine Cinnamon Sugar Topping ingredients in a small bowl and set aside. Stir together corn syrup, brown sugar and butter in a small bowl. Top batter evenly with cinnamon sugar topping. Spoon the Caramel Pecan Topping evenly over the batter. Place in a COLD oven, set temperature to 350°F, and bake 25 minutes, until lightly browned and firm in center. Cool slightly and serve warm with love and gratitude. The brands of ingredients are suggested based on the availability of the fun and exciting printable grocery coupons now available on www.CommonKindness.com, the free printable grocery coupon website that gives money to your favorite nonprofit every time you redeem a CommonKindness coupon. Other product brands can be substituted, but dishes tend to taste better when preparing them helps others.